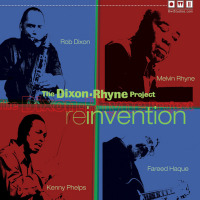 The configuration may be conventional, but Reinvention is the perfect title for The Dixon-Rhyne Project's debut. Sax/organ/guitar/drums quartets date back to the 1950s and organist Melvin Rhyne brings direct cred to this group, having played on some in the late 1950s and early 1960s including Boss Guitar (Riverside, 1963) and The Wes Montgomery Trio (Riverside, 1959). But the rest of this groupmost notably co-leader/saxophonist Rob Dixonconsists of relative youngsters for whom the music Rhyne made in his youth is a reference point, not a strict definer. Reinvention owes some to the soul jazz of decades past; equally it's part of the jazz-centric jam band of Greyboy All-Stars, Soulive and MMW. It's no surprise that "Chit'lins Con Carne" is the closest Reinvention gets to 1960s soul jazz. The only track not written by Dixon, it's culled from jazz guitar icon Kenny Burrell's classic, Midnight Blue (Blue Note, 1963). A bright blues with a solid backbeat from drummer Kenny Phelps, guitarist Fareed Haque's warm-toned, cleanly articulated playing is further evidence that this member of Indo-centric jam banders Garaj Mahal, who first came to attention in the mid-1990s on the Blue Note label, has always been impossible to pigeon-hole. The buoyant funk of "Melvin's Groove" recalls pre-Breezin' (Warner Bros., 1976) George Benson, more akin to his early albums with organist Dr. Lonnie Smith, but with an unmistakably contemporary sound. Rhynes, of course, fits into these classic-toned soul jazz tracks with ease. It's on the electro-centric near-fusion of "Tomorrow Sierra" and "Shadow and Light," however, with Haque's blindingly fast but never superfluous solos matched by the complete surprise of Rhyne's Mini-Moog and organ solos, that the attention the keyboardist has been paying to the changes going on around him become crystal clear. Young musicians are often criticized for not being conversant with the tradition, but legacy artists are rarely taken to task for not keeping up with the evolution of that tradition. Rhynes, with a career now in its sixth decade, has been doing anything but standing still. Dixon is clearly conversant in the language of jazz, even as he writes material that straddles the line between contemporary groove and retro vibe. All too many jam bands write charts with complex themes that settle into vamp-like and, consequently, easier to manage solo sections. Dixon challenges not only himself but his band mates with material where the ability to navigate changes and weave melodies through them is an absolute prerequisite. Reinvention doesn't break any rules, but it does bend them, and while there's plenty of muscular soloing to please jam band fans and those who like their fusion light and breezy, it's also an album that respects the tradition at its core, growing from it in an organic fashion. Rhythm happy and filled with memorable melodies, it's the kind of catchy contemporary disc that'll make believers out of those who think this kind of music is more defined by style over substance. Track Listing: Repub Club; Mel's Groove; Shadow and Light; Reinvention; Carousel; Chit'lins Con Carne; Tomorrow Sierra; Fantastic Prizes; Mind's Eye; Johannesburg. 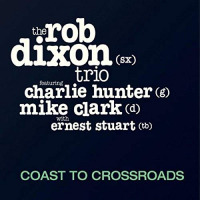 Personnel: Rob Dixon: saxophones; Melvin Rhyne: Hammond B3 Organ, Mini-Moog; Fareed Haque: guitars; Kenny Phelps: drums. Salar Nader: tabla (3, 7); Derrick Gardner: trumpet (5); Richard "Sleepy" Floyd: drums (4); Gary Mielke: percussion (2, 5).